The word cogeneration stands for the combined production of electricity and heat, obtaining an overall performance from the conversion higher than the separated production method for electricity and heat. The added value of a cogeneration system gives the possibility to produce electricity and at the same time to get back the heat that usually remains unused and dispersed in the atmosphere. In other words, a cogeneration system can be seen as a generating sets which, instead of the only electricity production , get back also the heat generated, improving the overall performances. Ali6 develops also trigeneration plants from 20 to 200 Kw. The trigeneration is the combined production of electricity, heat and refrigerating power. The combined production can improve the efficiency of using fossil fuel over the 80%; and result in lower costs and lower level of pollutant emissions and greenhouse gas, compared to separate production of electricity and heat. In the tertiary sector for temperate zones, the heat needed is restricted to few winter months, although there is a significant requirement for cold (air conditioning) during summer months. In this casem with a trigeneration plant, heat is used to produce cold through particular machines called “absorbers”. 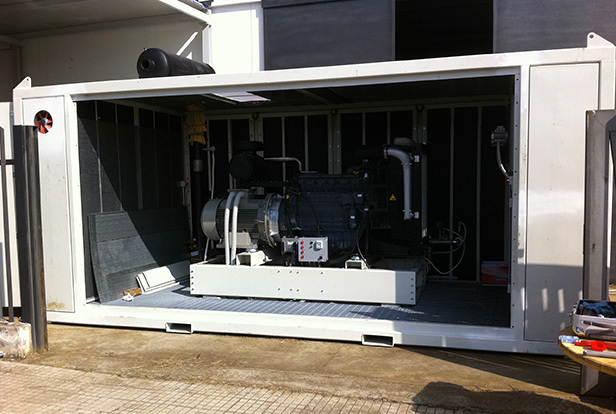 The generator used for the production of energy is typically an internal combustion engine and the operating principle is that of a generator, which burns fuel to produce electricity and heat simultaneously: normally the heat is dissipated through a radiator, in cogeneration instead, it is used to produce hot water usable for heating (T max 90 ° C). Use of thermal energy otherwise not used, with a consequent saving of fuel. Reducing the environmental impact of the reduction of polluting emissions and less waste heat released into the environment. Lower losses of transmission and distribution to the national electricity system arising from the location of the plants near the catchment areas and dall’autoconsumo energy produced. In the case of self-production of electricity, regional taxes and excise duties on fuel are defiscalizzate a function of electric power produced. Incentives granted to primary energy savings achieved through interventions and projects to increase energy efficiency. The residential sector, which is involved in the course of little cogeneration and which has a great unexpressed potential. The tertiary sector, which has registered in the last few years an improved rate of growth about the number of machines installed. In the agricultural sector the cogeneration could be applied for greenhouse heating, substratum heating and for micro-climatization as a defense for pests.